Colorado was named after the river of the same name, and is Spanish for "ruddy." Must be the way the magnificent mountain ranges defining the state reflected in the rushing waters. Besides those early Spanish explorers, Native Americans have left their mark on Colorado, with many impressive cliff dwellings, artwork and more. Then came European settlers pushing west, miners looking for gold and those just looking to celebrate the pristine landscape. Today, Colorado is a mix of the rustic and cosmopolitan (there are numerous film festivals, as well as food and wine events). Whether you're the outdoorsy type, or more into indoor activities, there's plenty to do in the Centennial State. Here are our 20 coolest picks. Before her role as a feisty Titanic survivor, Molly and her family lived in a beautiful mansion in Denver. The home is now a museum, beautifully preserved as it was during her life. Welcome spring at these gorgeous gardens, ranked among the top in the country. You'll find incredible variety, from the tropical conservatory to the tranquil water gardens, cactus building and more. Besides hiking, biking and camping, it's a fantastic place to photograph wildlife and the landscape. Or just revel in the quiet of the untouched wilderness. This refuge was established in 1967 for endangered birds - and so far, 198 species have taken them up on the offer. During spring, it provides prime opportunities for birdwatching. But you'll also spot everything from deer, moose, antelope and much more. Besides binoculars, bring a camera. It's one of the most breathtaking natural sites in the country - and among the most photographed. 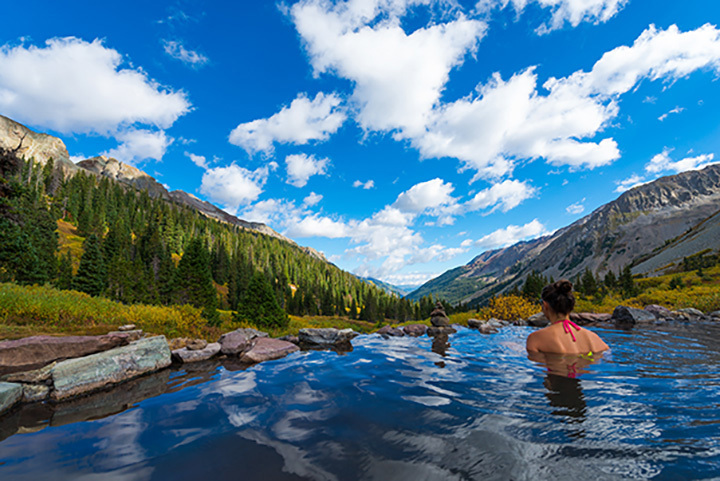 Take in the beauty of pristine Maroon Lake in Aspen, and snap your own shots of the surrounding mountains. Then take in more views by way of the many hiking trails. These towering red sandstone rock formations are a big draw, mainly for the way they pop against the blue Colorado skies. Pikes Peak in the background is just a bonus. You can learn more at the world-class Visitor and Nature Center, and savor the views from a glass-enclosed café. Step back into the 19th century as you ride this working train through the mountains (it still delivers supplies to nearby resorts). The open-air gondola car is a special treat. Just a few miles outside of Steamboat Springs are these gorgeous waterfalls. The crystal waters plunge 280 feet. Various hiking trails provide spectacular views. Thousands of years ago, the Anasazi Indians carved homes out of the mountainside. You can explore these fascinating dwellings today, and learn more at the adjacent museum. Colorado and mining go back a long way, and this place gives you a taste of those amped-up days, when hardy types hoped to strike it rich. Kids will love learning about the history of gold mining in the area - and the free sample they get at the end of the tour. Trail Ridge Road winds through Rocky Mountain National Park. Eight miles of the roadway lie above 11,000 feet - providing an amazing vantage point for checking out the fall foliage. Back in the day, dinosaurs roamed the state - and their tracks are evident today. One good place for walking with the dinos is in Picket Wire Canyonlands - there are 1,300 tracks, many left by the mighty brontosaurus. During September and October, male elk line up to serenade their harems and get them in the mood for love. You can hear the magnificent elk bugle calls at dusk in Moraine Park, located inside Rocky Mountain National Park. The Apaches knew this as the place where the Great Spirit of the Wind lived. When it was discovered by the white man in the 1800s, it instantly became a popular tourist attraction. You can opt for two different tours of this extraordinary natural wonder. Celestial Seasonings is one of the biggest tea brands in the world. Their factory in Boulder offers a fun tour that shows the behind-the-scenes activity that goes into those little bags. And you get free samples! Take a break from the cold and spend some time inside this world-class art museum. There's a huge range of Native American works, as well as the only major Asian collection in the region. And there are plenty of things for kids to do, as well. While Colorado is known for skiing, dog sledding is fast coming on its heels as a popular winter activity. There are several towns that offer a chance to ride behind a team of snow-loving pooches. "Mush!" After a day outside in the wintry landscape, there's nothing quite like a plunge into a relaxing hot spring. Dunton Hot Springs is a resort located within a recreated ghost town that offers numerous pools, ranging from 85 to 106 degrees. In January, ice climbers from all over the world converge on this town for a three-day festival celebrating the sport. Spectators really get into the climbing competitions, to see who will take the top prize. The popular annual Winter Brew Fest in Denver celebrates craft beverages from a variety of microbreweries in the region. There's also plenty of live music, food trucks and other cool vendors.